Let’s face it, we all rely on our cell phones a lot, whether it’s the navigation, communication or information, we just need our cell phones to be there. Now, if you are someone who rides a motorcycle every now and then, then we are pretty sure that there came a time when you wished to have your cell phone right in front of you to make a call, text someone or search for the route. Now, what if we tell you that the next time you want your phone, it’s going to be right in front of you attached to your motorcycle. Yes, you read it right, you now no longer have to stop during your ride and pull out the phone out of your pocket because again, it’s going to be right there in front of you. 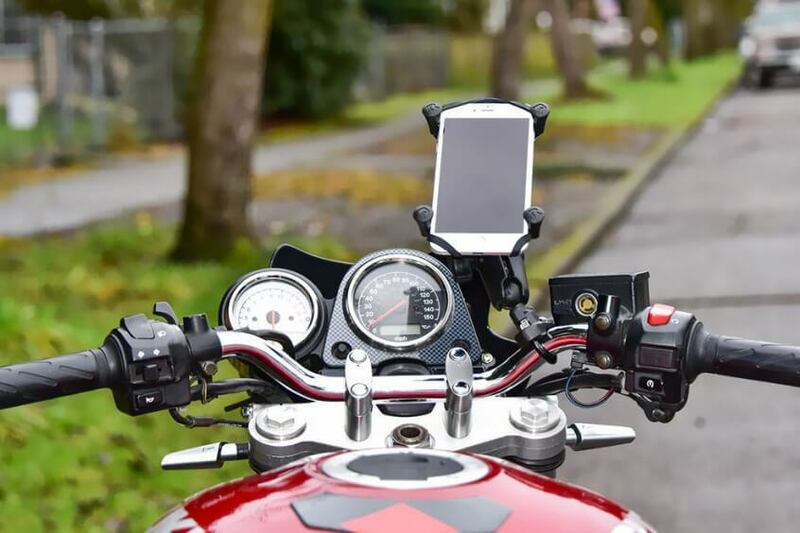 The one thing you need to have your phone attached to your motorcycle is a phone mount. A phone mount is basically a product that is made for the sole purpose of mounting your phone with your cycle to make it accessible for you. The market out there is full of motorcycle phone mounts, and most of them are just products made out of cheap plastic to earn some profit. So, before you buy a phone mount, make sure it comes with the best possible quality and is durable. Let’s be honest, the number one thing anyone would think of when it comes to a phone mount is that will their cell phone be safe and protected? Well, now the simplest way to figure this out is to buy a waterproof phone mount so that whether it rains or snows, you will just have your phone protected. So, before making a final purchase decision just make sure that the mount is capable of securing your phone from all the extreme weather conditions. As said earlier, the market is full of cheap plastic phone mounts that are not at all durable. So, the wiser thing to do is to buy a phone mount which is made with the best quality material. Moreover, make sure that the material used in the mount is durable and hopefully won’t slip around or break. You never know when you need to change your phone, and honestly, if you are buying a new phone, you wouldn’t like the idea of spending some more money on a new phone mount too. So, the wiser thing to do is to buy a universal phone mount that can fit all sizes and shapes of phones, this way you’ll end up saving yourself a lot of money, and you won’t have to change your mount every time you change your phone. These are a few things you need to consider before buying yourself a phone mount. As far as the installation is concerned, well you need to follow the instructions properly and make sure that fitting isn’t loose.